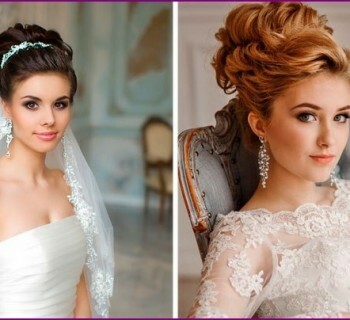 Creating hairstyles for the solemn wedding day- It is an important task for every girl. Correct installation should ideally fit the image invented by the bride, to emphasize the dignity of the person, and sometimes even help in its visual modeling. 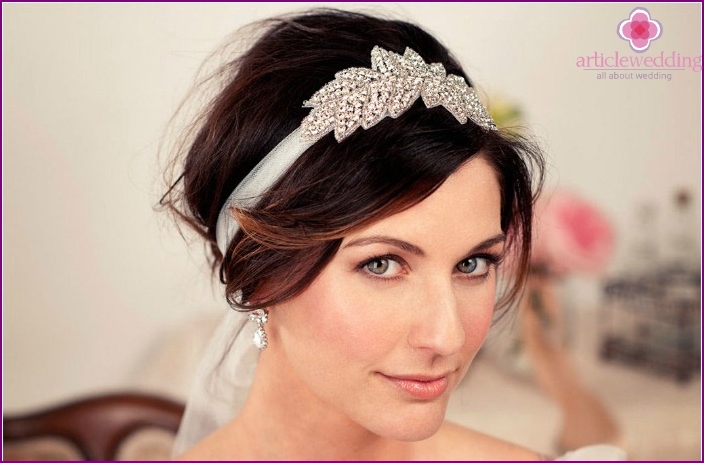 In addition, it is necessary to choose the right accessories that adorn her hair. 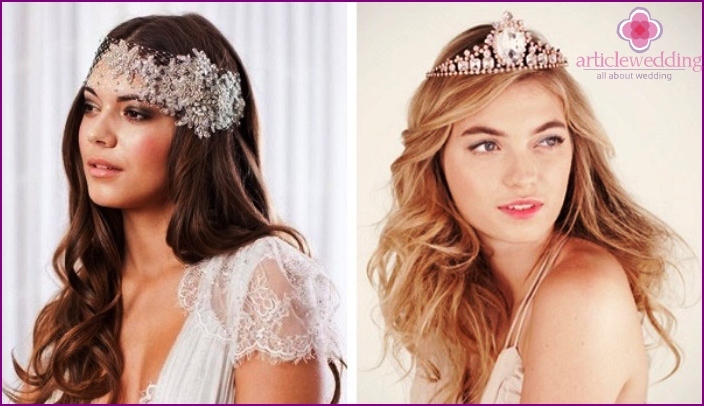 For those girls who dream to feel like royals during a celebration, suitable hairstyle with a crown. This magnificent accessory comes in several forms - every bride will find a suitable alternative. 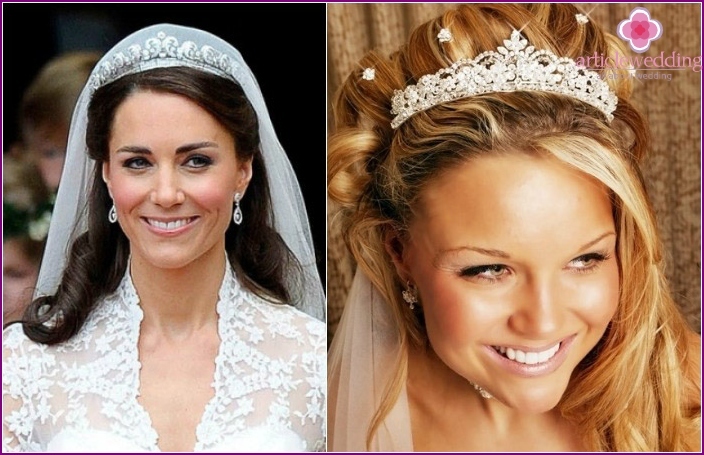 Crown as a hair ornament known for a longtimes, it is usually worn by royal families. Only in the last century, this accessory has become very popular and has been made available in the usual girls - has changed the perception of this attribute, the materials from which made a crown, and as a consequence - its price. As decorative materials for the beautiful tiara can be used a variety of items - a sea pearls, beaded beads, shining crystals, semi-precious and precious stones, jewelry made of colored metal. Classic crown. It will allow the bride to create a truly majestic, royal image. Girls with the crown should give preference elegant collected hair. Little diadem. 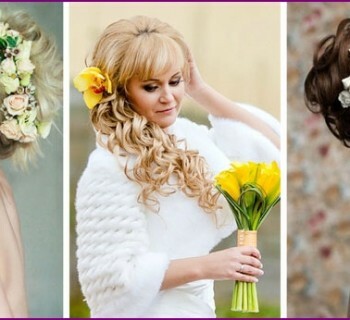 This accessory looks cute, innocent and fun, it is perfect for short flowing hair - curly curls, or in stacked smoothly, although long-haired bride look amazing with him. In the form of the rim - this vintage holiday version of the image, it looks good with the hair and veil, where the hair is collected beam Malvinka or twisted stylish large curls. East. Beautiful crown fit mysterious, romantic girl's image, this accessory will look great with her neatly coiffed hair, a little worse for wear curls or smooth high hair and veil. Access is worn on the forehead or in the form of falling "brooch" why brides should be careful to select an option for wedding decorations. Hairstyle spider - this type of styling, when hairFrench plait braided around her head. This type of creation of wedding image looks elegant, bride helps maintain the original, romantic image. To carry out such a professional styling master can as long and at medium hair. In this case, the veil can be mounted in a place where the "middle" Webs (for more details see the photo). Complete the image of a wonderful concise crown. 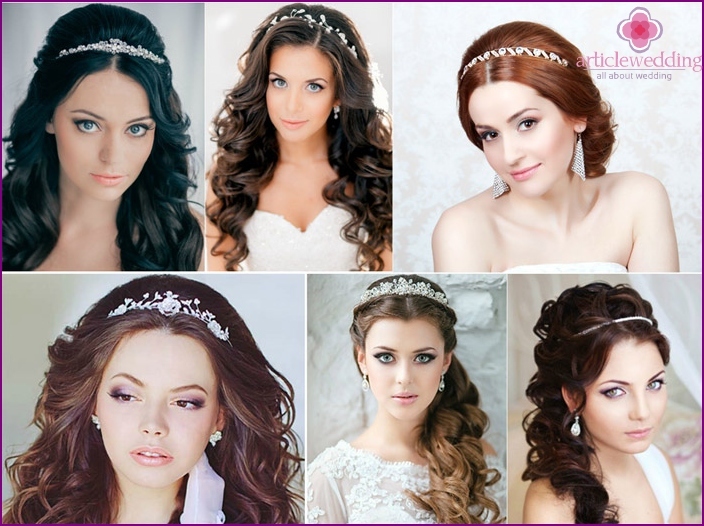 To emphasize the original accessorychosen bride, the wizard can create a real crown of hair. Ideally this option looks for long hair - then "structure" get lush, rich and solemn. This updo is well combined with both miniature and with the usual crown, as well as accessory that "skirts" on all sides, stressing the majestic image. Fata in this case, will be attached to the back of the head, where the ends chic styling. Updo with braided. This beautiful view of laying open the neck of the bride, create a chic color composition, which will be the main decoration of the image. Fatou in this case it is better to wear on his head, so that guests can see the spit. Kos fired side. 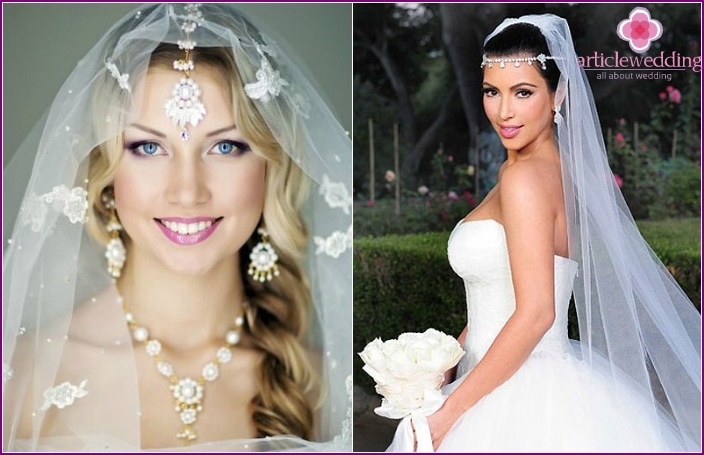 As a rule, creating a festive way, stylists are trying to abandon the symmetry, if a girl does not have a perfectly harmonious facial features, so graceful braiding bride wear on her side, and the beautiful princess crown adorns the head with a veil. Headgear clings on top. How to make a hairstyle with a diadem on long hair? Splayed, neatly arranged curls. 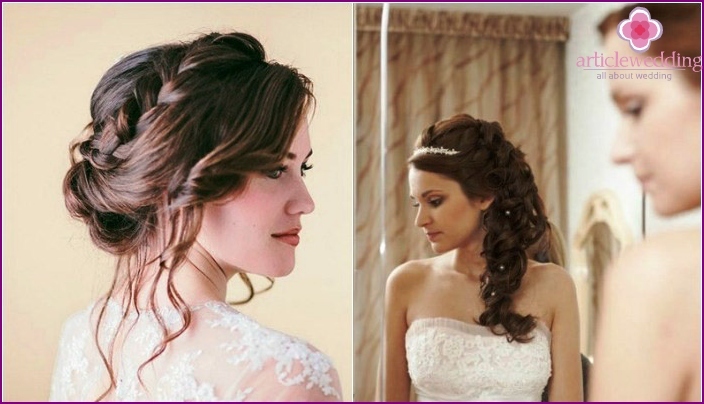 Large curls or small curls will look great at the ceremony, the bride will help create a festive, luxurious way. Diadem only emphasize the culprits royal style celebration. Splayed effect not comb the hair. Over the past few years it has become very popular style styling that suggests a little careless arrangement of curly or straight hair. Bride laying look natural, but, paradoxically, in the creation of this kind takes a lot of time, effort and styling products. Crown makes this image more gentle, sweet. Low beam - this styling looks stylish,interesting. It is suitable for creating romantic, gentle way, as well as for an elegant, refined. 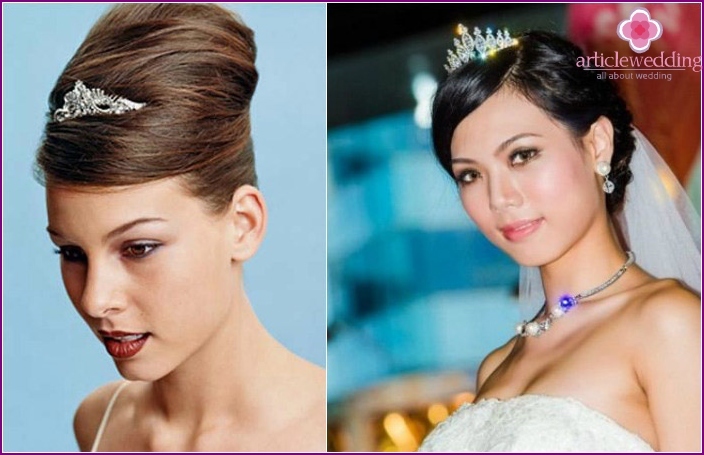 The beam may be made of smooth, straightened hair, creating a little strict, royal look of the bride, or with a slightly curled head of hair - then get relaxed styling option that will appeal to the romantic ladies. Updo. 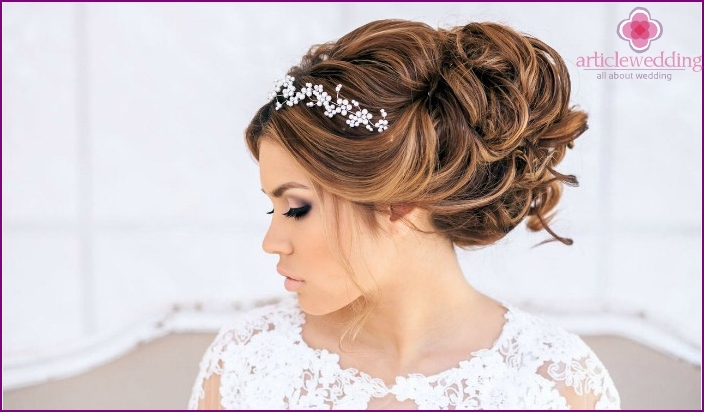 If the bride wants to look grand, there is no better option than the high styling long hair. Most hair length will allow the master to come up with many ideas for creating a beautiful, original "building" on the head. It can be complicated designs with braids decorated with scrolls, screens, gossamer, smooth Babette, or hair-crown, which was already mentioned above - it all depends on the wishes of the culprits celebration and fantasy of a professional stylist. Crown must necessarily be combined with the dress the main character of the holiday. If it is decorated with rhinestones, you can not select an accessory, decorated with pearls - it will look ridiculous. The smaller the outfit adorned with decorative elements- The richer the tiara can be, it also applies the other way around: do not overload the image details. If the emphasis is on the way of dress, hair neatly combed better, and top "plant" a laconic decor. It is desirable that the maximum amount reached three accessories. 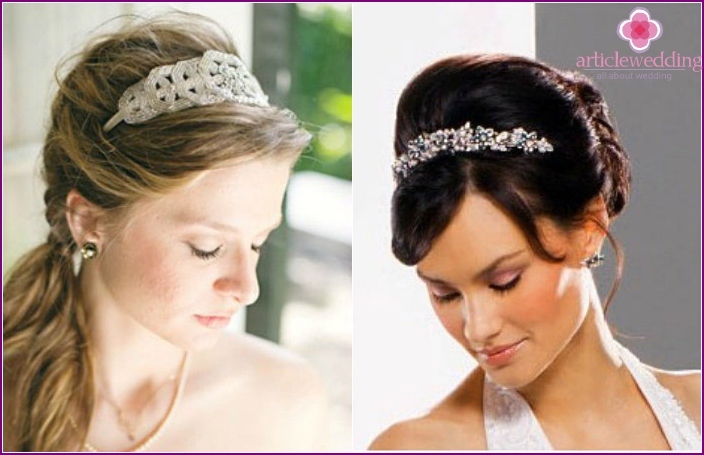 An important rule - just choose a convenient crownbecause even a little bit oppressive at the beginning of the day diadem in the registry office is able to cause a severe headache, which may spoil the groom with the bride the most important day of their life together. If bride straight bangs, will soften the image of her laying ladder. If a girl wants, on the contrary, to emphasize his sharp temper, she should do hairstyles line more smooth, smooth. 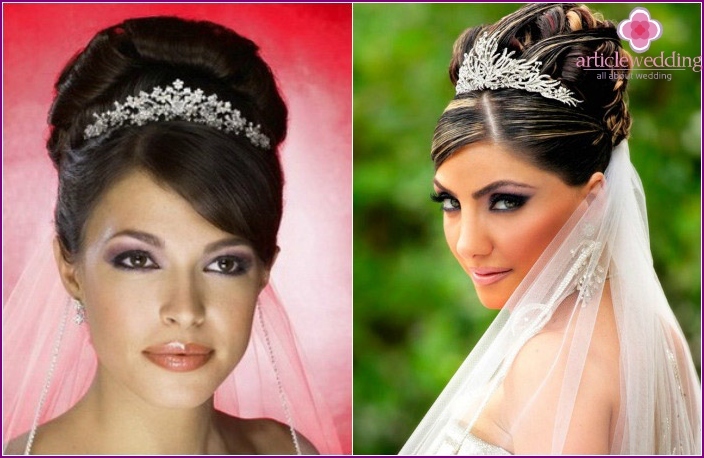 Try on the crown, experts recommend only with the dress, to evaluate whether combining two decorations.